1. REMOVE CONTENTS FROM BOX. VERIFY ALL PARTS ARE PRESENT. READ INSTRUCTIONS CAREFULLY BEFORE STARTING INSTALLATION. CUTTING IS REQUIRED. 2. NOTE: It may be necessary to remove/relocate front license plate and license plate bracket. It is not required, but strongly recommended. If local/state law requires a license plate, a license plate relocation kit is available. 3. Start installation from under the front of the vehicle. Determine if the vehicle is equipped with tow hooks. a. Remove the steel bumper and brackets to access the hardware securing the tow hook to the frame channel. b. Remove the factory tow hook from the end of each frame channel, (Figure 1). NOTE: This Bull Bar is not compatible with tow hooks. c. Cut out the opening in the plastic bumper insert to clear the Mounting Brackets, (Figure 1). d. Reinstall the bumper after tow hooks have been removed and the openings have been cut out and checked for clearance. a. Cut out the indented area in both sides of the plastic bumper insert to clear the Brackets as pictured, (Figures 1 & 2). IMPORTANT: Make several small cuts for best fit. Do not cut through the top edge of the panel. NOTE: The plastic panel is held in place with several small screws that are difficult to reach and remove. If you prefer to remove the panel to cut out the openings, it may be necessary to remove the steel bumper to access all of the small screws and clips. b. Reinstall the bumper once openings have been cut out and checked for clearance. 4. 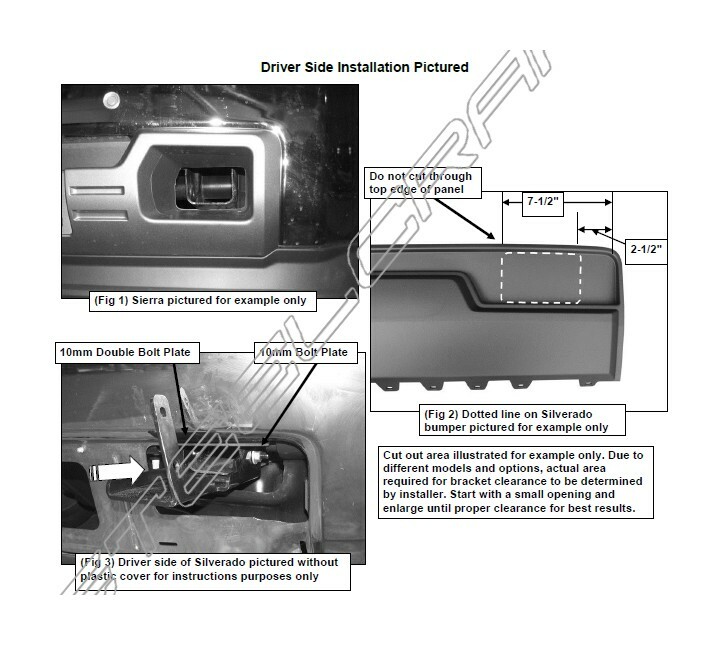 Select the driver side Mounting Bracket. Insert the Bracket through the opening in the plastic bumper, (Figure 3). Line up the (3) holes in the Bracket with the holes in the end of the frame channel. 5. Select the 10mm Double Bolt Plate, (Figure 4A). Insert the Bolt Plate into the end of the frame channel, through the holes in the Bracket and out the side of the frame. Secure the Bolt Plate to the Brackets with (2) 10mm Flat Washers, (2) 10mm Lock Washers and (2) 10mm Hex Nuts, (Figure 4B). Leave loose at this time. Repeat this Step to install the 10mm x 35mm Bolt Plate, (Figure 5A), into the remaining hole in the side of the Bracket and frame channel, (Figure 5B). 6. Repeat Steps 4 & 5 to install the passenger side Mounting Bracket. If the bumper was removed, align the bumper to the vehicle and tighten all factory hardware. 7. 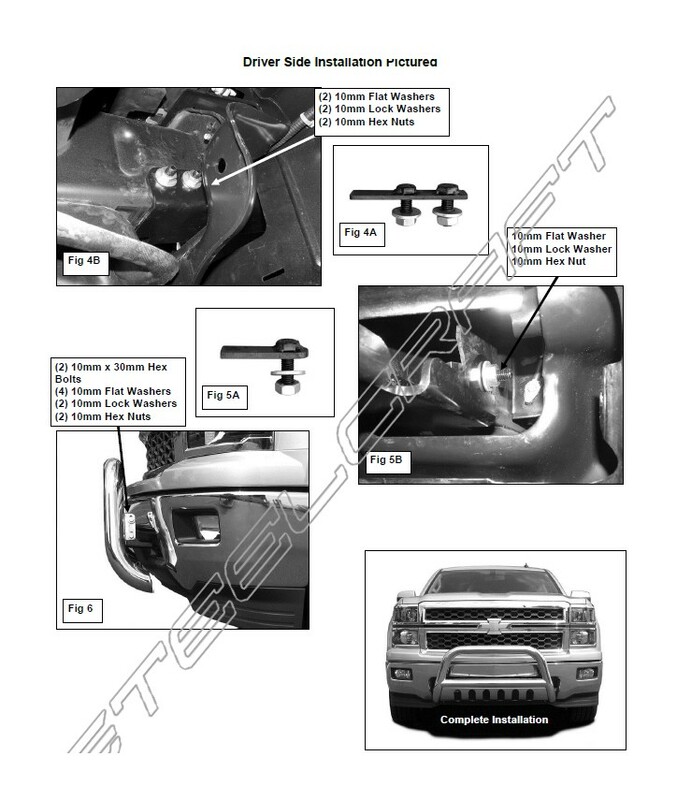 With assistance, position the Bull Bar up to the outside of the Mounting Brackets. Bolt the Bull Bar to the Mounting Brackets using (4) 10mm x 30mm Hex Bolts, (8) 10mm Flat Washers, (4) 10mm Lock Washers and (4) 10mm Hex Nuts, (Figure 6). 8. Align and adjust the Bull Bar and tighten all hardware. 9. Do periodic inspections to the installation to make sure that all hardware is secure and tight. To protect your investment, wax this product after installing. Regular waxing is recommended to add a protective layer over the finish. Do not use any type of polish or wax that may contain abrasives that could damage the finish. For stainless steel: Aluminum polish may be used to polish small scratches and scuffs on the finish. Mild soap may be used also to clean the Bull Bar. For gloss black finishes: Mild soap may be used to clean the Bull Bar.